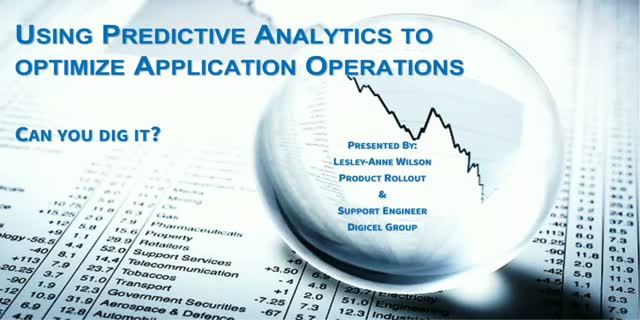 Using Predictive Analytics to optimize Application operations: Can you dig it? Many studies have been done on the benefits of Predictive Analytics on customer engagement in order to change customer behaviour. However, the side less romanticized is the benefit to IT operations as it is sometimes difficult to turn the focus from direct revenue impacting gain to the more indirect revenue gains that can come from optimization and pro-active issue resolution. I will be speaking, from an application operations engineers perspective, on the benefits to the business of using Predictive Analytics to optimize applications. Title: Using Predictive Analytics to optimize Application operations: Can you dig it?